Dr. Yang, Jwing-Ming instructs and demonstrates "The Eight Pieces of Brocade", one of the most popular sets of Qigong (chi kung) healing exercises. These gentle breathing, stretching and strengthening movements activate the Qi (chi) energy and blood circulation in your body, helping to stimulate your immune system, strengthen your internal organs, and give you abundant energy. With both a sitting and standing set, anyone can practice these simple and effective exercises in as little as 20 minutes a day. This revised edition of our best selling beginner qigong book includes a new and modern easy-to-follow layout. Every qigong movement is presented in 4 large photographs with clear instructions, followed by an analysis of how the movements aid in improving health. Improve your health in 10 to 20 minutes a day! You will use The Eight Pieces of Brocade, one of the most popular qigong healing exercise sets, to improve your overall health and well-being. No matter your age or your physical condition, the Eight Pieces of Brocade is a wonderful way to improve your health and well-being. Commonly known in China as the Ba Duan Jin, these exercises have been practiced for over 1,000 years! Using the book with the companion DVD is a great way to learn these powerful health exercises. 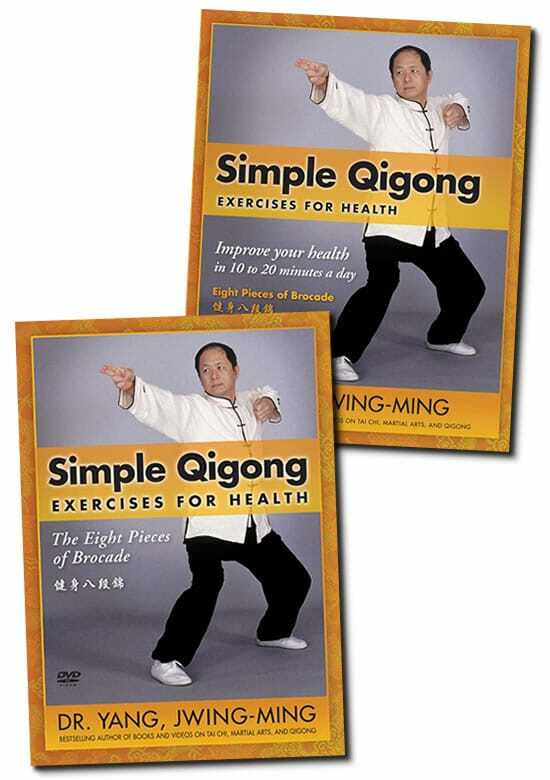 In his bestselling qigong DVD, Dr. Yang, Jwing-Ming instructs and demonstrates "The Eight Pieces of Brocade", one of the most popular sets of Qigong (chi kung) healing exercises. These gentle breathing, stretching and strengthening movements activate the Qi (chi) energy and blood circulation in your body, helping to stimulate your immune system, strengthen your internal organs, and give you abundant energy. With both a sitting and standing set, anyone can practice these simple and effective exercises in as little as 20 minutes a day. Known in China as the Ba Duan Jin, The Eight Pieces of Brocade has been practiced for over 1,000 years. Also included are the ‘secret words’ - poems and songs that have been used to pass this knowledge down from generation to generation, which contain the key to each of these ancient medical qigong movements. This DVD edition includes a detailed and fascinating qigong lecture by Dr. Yang, Jwing-Ming, with over an hour of additional explanation and instruction for each of the qigong movements and the history of The Eight Pieces of Brocade.